Taman Impian Jaya Ancol otherwise known as Ancol Dreamland is an integral part of Ancol Bay City, a resort destination located along Jakarta's waterfront, in Ancol Kelurahan, Pademangan, Indonesia. It is owned by PT. Pembangunan Jaya Ancol Tbk, a subsidiary of Pembangunan Jaya Group. Ancol Dreamland opened in 1966 and is currently the largest integrated tourism area in South East Asia, boasting an international championship golf course, a theme park, hotels and other recreational facilities. There are 27 rides at Fantasy World, 8 pools at Atlantis Water Adventure and 8 shows at Ocean Dream Samudra. Before Ancol Dreamland, Ancol was a mosquito-infested swamps and fish ponds, and the source of century-old malaria outbreak in Batavia. The idea to convert the marshy area of Ancol into Jakarta's largest entertainment center, with housing and industrial estates adjoining it, was proposed by President Sukarno in the early 1960s. The idea opposed the initial idea to convert the area of Ancol into a purely industrial area. Actual development of Ancol was started during the tenure of Ali Sadikin, the governor of Jakarta in 1966. The entertainment complex was named Taman Impian Jaya Ancol or Ancol Dreamland. The first facility was the Bina Ria Ancol beach, best known for its drive-in theater especially during the 1970s, then followed with a golf course, swimming pool, oceanarium, Putri Duyung cottage, Hotel Horison and its casino. The Dunia Fantasi (Fantasy World) theme park was built in 1984. Today, the 552 hectare recreation area is known as the Ancol Jakarta Bay City, contains hotels, cottages, beaches, a theme park, traditional market places, an oceanarium, a golf field and marina. Dunia Fantasi (often shortened to "Dufan") is Jakarta's own theme park complete with over 40 rides and attractions. It is located in North Jakarta, facing the Java Sea. The theme park is divided into eight regions which are Jakarta, Indonesia, Asia, Africa, America, Europe, and Fantasi Hikayat (Legendary Fantasy) region featuring Ancient Greece and Ancient Egypt architecture. The theme park complies with international standards through ISO 9001:2000 certification. Admission to Dunia Fantasi is chargeable at around Rp 195.000 from Mondays to Fridays, and Rp 275.000 on Saturday, Sundays and public holidays. It is considered as Jakarta's largest and most interesting recreation park, and located on reclaimed land at the Bay of Jakarta. According to the Jakarta Tourism & Culture Office website, other attractions within include the Art Market, an Eco-Park and an Ocean Park. In the district of Ancol where Dunia Fantasi is located, it is a common getaway for tourists and locals alike, away from the hustle and bustle of the city. Among its most popular attractions are Halilintar (a roller coaster manufactured by Arrow Dynamics) , Niagara-gara (a log flume), Istana Boneka (a local version of Disney's It's a Small World) and Balada Kera (Monkey Parody – animatronics show) Theater show. Other attractions include Bianglala (ferris wheel), Kora-Kora (swinging ship), Poci-Poci (spinning cups ride), and Hysteria (drop tower). Several of the latest and newest rides are Kicir-Kicir (Power Surge) (2004), Perang Bintang (Star Wars) (2005) - an interactive dark ride, Meteor Attack (2006) and Tornado (Windshear by Zamperla) (2007). Some seasonal attractions include Le Belles cabaret show, Russian Circus and Euro Kids Circus. A former theater that used to house the Rama Shita ride was also emptied and converted into a large indoor exhibition hall, occasionally hosting special shows. It now houses the Ice Age: Sid's Tour attraction. Since June 21, 2011 Dunia Fantasi (Dufan) will open Kalila Adventure Animatronic Theater which is the most complete in the world. The theme stories are about Beautiful Indonesia. The park has recently announced a new area with 9 new attractions: Baling Baling (a Zierer Star Shape, also the first in Asia), Paralayang (an SBF Visa Group Airborne Shot), Turbo Drop (an SBF Visa Group Drop'n Twist), New Fantastique (a live show), Haunted Coaster (a horror themed indoor tracked ride from an unknown manufacturer), Karavel, Kolibri, Zig Zag and Ontang Anting. Atlantis Water Adventure was built on the former site of Gelanggang Renang (Swimming Courtyard). Occupying over five hectares of land, this water park is themed on the mythological underwater world of Atlantis. Its facilities include a wave pool, continuous flowing river pool, rainbow ball pool, waterfall pool, several slides, two children's pools, five restaurants, and a food court that was imported from India, Brazil, Spain, Bangladesh. A volleyball court and event center are also available to accommodate the needs of visitors. Ocean Dream Samudra features several animal shows, a small aquarium, and a 4D theater. The trained animal shows include a dolphin show and sea lion show. The 4D theater projects 3D image movies with sensations such as cool breezes and water sprays located inside a large building with Mesoamerican pyramid theme. On 2011 Ocean Dream Samudra will be revitalized with the budget Rp.27 billion ($3.1 million). Ocean Dream Samudra now holds the "Under the Sea Musical Dance" attraction at Underwater Theater. SeaWorld Ancol was the largest oceanarium in South East Asia at the time it was opened, in 1996, as SeaWorld Jakarta. It was owned by Lippo Group until 2014, when contract problems caused it to be owned by Jaya Ancol now. It features the acclaimed Antasena tunnel as well as the sea friends pool, main pool, alligator pool, and shark pool. Despite its name, it is completely unaffiliated with the US-based SeaWorld Parks & Entertainment and their parks in Orlando, San Antonio, and San Diego. There are two main beaches within the resort, the Carnival and Festival beach. British band Iron Maiden has played for the first time in Indonesia on 17 February 2011 at the Carnival Beach site, to over 25,000 strong crowd. Pasar Seni is an Art Market that started over 25 years ago. . It has become a center for handicrafts and art products. This art market has an open state, plaza, and souvenir shops. Pasar Seni has also become a center where artists would create and sell their products. Every Friday night at 8:30 pm, Pasar Seni Ancol organized the event named "New Friday Jazz Nite". Ancol's Golf Course has recently relaunched as Executive Golf Fun. This is Indonesia’s first international beach golf course with 18 holes spread over an area of 33 hectares. The golf course has a pro-shop, an executive room, a meeting hall and restaurants. Ancol Dreamland has several facilities for games and entertainment. One of these facilities is Jaya Bowling. This bowling center is the first and largest bowling center in Indonesia. Indonesia's National Bowling Training Center is in Jaya Bowling. It was built in 2011 by PT Global Land Development Tbk with a budget of Rp.15 billion ($1.7 million). This area consists of 4 themes, Eco Energy, Eco Care, Eco Nature and Eco Art. It once hosted the 2013 World Robot Olympiad and the finale and result and reunion show of Indonesian Idol 2012. Ancol Beach City is a new Lifestyle & Entertainment Center in Ancol, Jakarta. It was built by PT Wahana Agung Indonesia, a subsidiary of PT Global Land Development Tbk (now MNC Land). There'll be a Madame Tussauds wax Museum, Mata Elang International Stadium Concert Hall with a maximum capacity of 22.000, 77 culinary centre, 42 shops, etc. Ancol Dreamland can easily be reached by car, motorcycle, electric train (KRL), or the TransJakarta Busway. Passengers who wants to go to Ancol Dreamland by train can arrive on Kampung Bandan or Ancol Station. Because Ancol Dreamland is so large, effective transportation has been a concern. 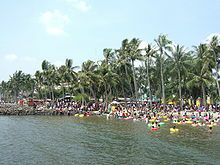 Some transportation methods around Ancol Dreamland include becak (rickshaw) and other vehicles such as train ride from the east entrance to Carnaval beach, and gondola to help tourists navigate around the area to their next destination. Passengers from Kampung Melayu, Harmoni, and Pusat Grosir Cililitan can use Transjakarta Busway to go to Ancol Dreamland. This is the latest transportation alternative in the area. 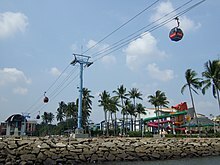 The Gondola is a skylift cable car system with thirty-seven cars built along the shore of Jakarta's bay. It offers a view of the resort and the sea as well as the city. Putri Duyung Cottage is the home of beach cottages with over 137 waterfront rooms. Putri Duyung Cottage is also one of building projects of PT Global Land Development Tbk. Mercure Convention Centre, formerly the Hotel Horison, is a four-star hotel that consists of a hotel tower and large mice facility. The hotel was built in the 1970s as the largest hotel at Ancol. In the 1970s, there was the Copacabana Casino, one of the three legal casinos in Jakarta that were licensed in 1967 by Governor Ali Sadikin (the others being casinos on Jalan Thamrin and Jalan Hayam Wuruk) in order to raise venture to help fund development of the city's infrastructure. Pressure from religious leaders eventually forced the government to ban all gambling in 1981. Hotel Raddin Ancol is an Accor's Mercure managed hotel located by the side of Dunia Fantasi. Ancol project also included a residential development to the east of Putri Duyung Cottage developed back in the 1970s. Some of the residential projects were the Ancol Mansion apartment complex. Ancol Taman Impian is planned to be expanded mainly through land reclamation along Jakarta's bay with a land reserve of over eighty hectares. Ancol Taman Impian is aiming for the Ancol Spektakuler 2015 (Ancol Spectacular 2015), a long-term goal which includes a major expansion of the current Dunia Fantasi theme park as well as the construction of the Marina Sports Centre and Carnival Beach Club. A cement-based decorative wall of a water slide of the Atlantis Water Adventure Park collapsed due to corrosion and made a part of the wall of water slide also collapse in September 25, 2011 injuring 4 visitors, including a child. The Jakarta Construction Supervision and Regulation Agency (P2B) said "There will be an audit by a consultant before the management is allowed to rebuild the collapsed structure." Less than 3 months before, there is another cement structure that collapsed and on July 2011, 15 passengers panicked when they were stuck on their seats when the Tornado thrill ride stalled. ^ a b Merrillees 2015. ^ "5 injured in Atlantis water park accident". September 25, 2011. Archived from the original on 2011-10-02. ^ "At Least 2 Injured in Ancol Water Slide Collapse". September 25, 2011. Archived from the original on 2011-09-27. ^ "Atlantis to be penalized over accident". September 29, 2011. Wikimedia Commons has media related to Ancol Jakarta Bay City.